In this report, NSS Labs simulated an enterprise network that has branches connected to a data center through two links: an MPLS line and a commercial broadband connection. They reviewed a select number of vendors, testing their throughput performance, video quality and VoIP quality as well as security effectiveness. 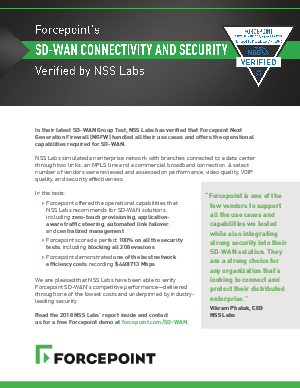 NSS Labs verified that Forcepoint NGFW handled all of their use cases and offers all the operational capabilities that they recommend as necessary for SD-WAN as well as scoring 100% across all security tests, blocking all evasion techniques. Read the report and learn how Forcepoint delivers SD-WAN with enterprise scale and security to match your distributed network needs. Also available is the 2018 NSS Labs NGFW Test, where Forcepoint NGFW received the highest score in security efficacy.